Format: Audible/Kindle using Whispersync Voice. Summary: The novel begins in 1945 shortly after the end of the war. A former field nurse, Claire Beauchamp Randall is in Scotland reconnecting with her husband, Frank. Claire and Frank are going through the normal awkwardness of becoming comfortable with each other once again when something astonishing happens. Claire is visiting one of the many ancient stone circles scattered about the countryside when suddenly she finds herself in the middle of a battlefield. In 1743. First a little background–I love historical fiction, especially when set in the United Kingdom and I’ve recently become interested in the Jacobite rebellions. I am not intimidated by long books or series, in fact I prefer them most of the time. I also tend to take recommendations from my friends fairly seriously. Knowing all that, I don’t really understand why it took me years to read Outlander. Plus there’s the added benefit of hotties in kilts. Historical hotties in kilts. That should have been enough to convince me. 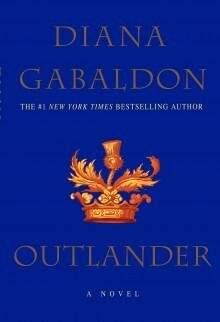 Well whatever the reason, a group of my online book friends decided to read (or re-read) Outlander for our New Year’s read. What happened was a surprise even to me. Going into the read, I knew little about the novel except that the romantic leads are Jamie and Claire, somehow Claire travels back in time to meet Jamie in all his kilt-god glory and the story really starts from that point. From the recommendations I’d gotten I expected a well written historical romance, a solid 4 star read. What I got was an emotional roller coaster of love, angst, torture, political intrigue and action. At any point in the book you could find me cursing the book or crying over it, usually both at the same time. Definitely not a fluffy historical romance. I originally tried to write this review as soon as I finished the book but I was in such a daze from some of the chapters near the end it took a while longer before I could be articulate in any way. Now that I’ve had some time to think about it (and become obsessed in ways I didn’t quite expect) I still don’t know if I can express how wonderful this book is. There are so many characters to fall in love with in Outlander (not just Jamie) and I think that’s why I feel so compelled to continue reading. I dare anyone to read this without crying, laughing, hurting alongside and falling in love with each and every one of them. What I can say for sure is I’m very glad I read this book and will have to thank my RKB friends for recommending it after I finish strangling them for doing it. Not only will I continue with this series, I know I will read this one again. At some point. With a bottle of scotch and a box of tissues.